RebateBlast at Fall Happenings: It’s Apple Season! This is the time of year when thoughts turn to this season’s one-of-a-kind type of fun. Great travel deals will take you to the best areas in the country to pick those red ripe ones or visit the world’s largest - the Big Apple. Whichever is on your agenda, start planning your festive fall getaway and enjoy deep discounts on your next escape! Apple picking is a fall tradition in the Northeast, Mid-Atlantic, upper Midwest, and upper Northwest of the United States. Apple orchards are located throughout these areas providing families and friends with incredible memory-making activities. 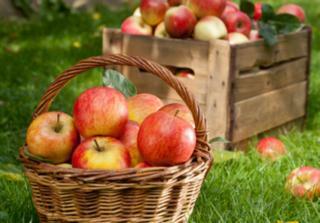 Hayrides, orchard tours, cider tastings, corn mazes and picking a wide variety of Red Delicious, Golden Delicious, Fuji, Gala, Granny Smith, Honeycrisp, Cripps Pink, Braeburn, Cameo apples and more are a great way to celebrate the harvest. As you plan your trip, call local orchards to make sure they are open as well as confirm that the apple varieties you want are producing and available for picking. Priceline up to 7% Rebate Save up to $500 on Florida vacation packages from $254 pp! CityPASS up to 6% Rebate Admission Pass to 6 New York attractions a savings of 42% at CityPASS. New York, Michigan, Pennsylvania and Washington are the top four apple-producing states. Think about where you want to go, keeping in mind that views from some of these orchards can be unforgettably breathtaking! Do your research for the top locations. As you plan your trip into the country for this season’s apples, be sure to rake up the autumn savings from Priceline®, Expedia® and CheapOair®. If you book by October 30th, you’ll be sure to take a bite out of your travel expenses! New York City in the fall is a sight to be seen! This may be one of the best times to visit the city that never sleeps. Summer crowds have gone home and holiday tourists haven’t arrived, so you can explore the sights without the usual hustle and bustle. The cool, crisp fall air is perfect for walking the blocks of Times Square, Wall Street, Chinatown or Little Italy. Mid-October through early November are the peak of fall foliage in the city. Wander Central Park and take in the beauty of its changing leaves or jump aboard a sightseeing cruise to experience autumn in the Hudson Valley. Before visiting the Big Apple, be sure to pick up a CityPASS® and save a ton on admission tickets to the city’s top attractions. Get this ticket booklet at a single reduced price and avoid main entrance ticket lines at most attractions. So take advantage of the crisp weather, gorgeous foliage, and the ripening crunch of the season’s best fruit! Plan your autumn vacation and get out to enjoy the festive fall season.